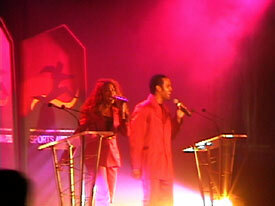 The National Sports Awards event is a biannual opportunity to recognize and celebrate indigenous achievement in sports. 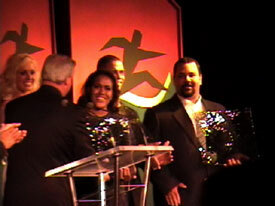 Nominees come from local and national athletic circles for sports as diverse as dart throwing, running, wrestling, boxing, and rugby. This year's nominees included national figures such as Cathy Freeman, Kyle Vander-kuyp, Anthony Mundine, as well as local La Perouse notables Marjorie Dixon and Lauren McFadden. A bus load for people from La Perouse made our way to the Sydney Convention Centre in Darling Harbor to show our support for and honor Auntie Margie and Lauren's accomplishments. 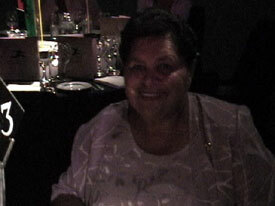 Come, take a peek at some of the highlights of the 2001 National Aboriginal and Torres Strait Islander Sports Awards. Kath's first movie! 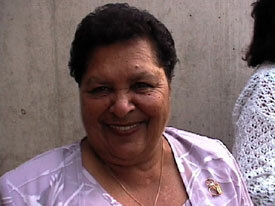 The title frame of the movie shows the LaPa mob arriving in our white chariot - the Guriwal Community Bus. 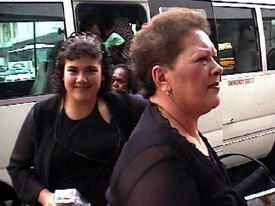 Lauren and her mother, Lois, are captured here dressed to the nines. Looks like athletics runs in the family as Grandmother and Granddaughter are both honorees for the evening. Lauren McFadden, a nationally ranked Karate champion at 14, was La Perouse's nominee for National Junior Sportswoman of the year. Rene gets pumped up for a night with the stars and grabs a quick smoke before the festivities begin. 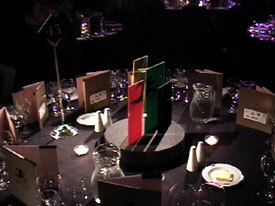 The table settings at the awards ceremony were set for kings and queens. 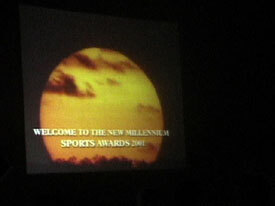 The Awards begin - Welcome to the 2001 National Aboriginal and Torres Strait Islander Sports Awards. A band named JAVA open the evening with a tune. The National Junior sports men and women hold their awards and pose for a picture. 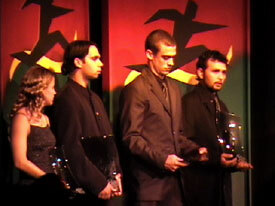 The Indigenous Olympians from the 2000 Sydney Olympics were also honored during the awards ceremony. 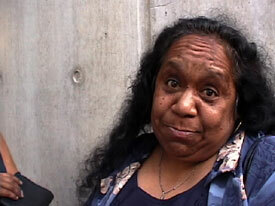 A while back, this lady found a medal belonging to an old Aboriginal woman in her back yard. 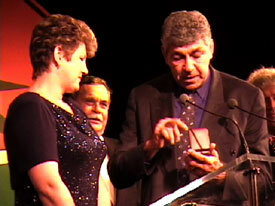 In a moving moment, the medal was returned to the woman's family after being lost for 36 years. Anthony Mundine poses with the late Charles Perkins' wife. 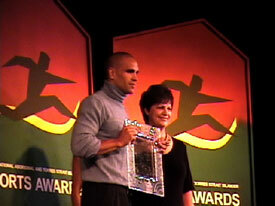 Mundine was awarded the Charles Perkins Memorial Sports Award. 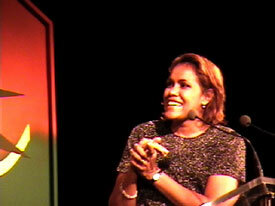 Cathy Freeman is awarded the Indigenous Media Award. 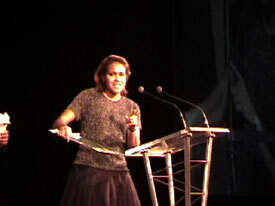 She thanks the media for educating the public about Koori issues. 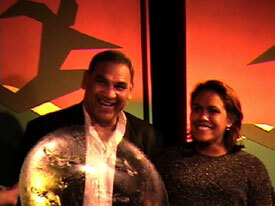 Mundine Sr., the former great boxer, presents Cathy Freeman with the award for National Sportswoman of the Year. Cathy gives a rousing acceptance speech thanking her family for always making her feel like something special and asserting her pride at being an Aboriginal person. 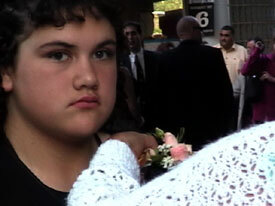 Although she didn't take home an award, Auntie Margie is not disappointed. She smiles at being second only to Cathy Freeman. Always a good sports, Lauren says, "It was just an honor to be nominated. 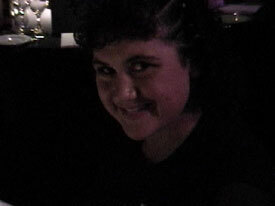 It was a great night."